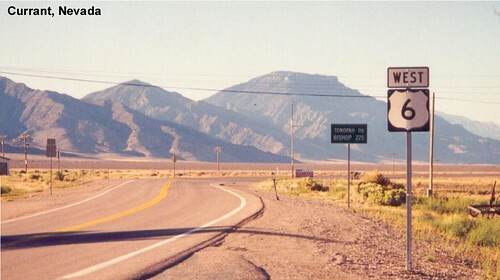 US 6 entering Nevada from Utah. The Schell Creek Range sits ahead of US 6. Ely is the first town we encounter as we head westbound through Nevada. The morning sun lights US 6 as we continue west. We had hoped to make a quick stop in Currant, but the businesses had all been abandoned. US 6 in Nye County. After leaving Ely it's a long way to the next town with any services. A very long distance view down US 6. US 6 is multiplexed with US 95 here in Esmeralda County. When I first drove US 6 the speed limit was still 55, but had been raised to 70 by my second trip.